So if you guys have been following my posts then you know beyond a shadow of a doubt that I am a huge nerd who loves his D&D almost as much as he loves his comics. 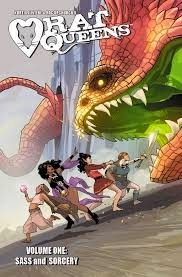 With Rat Queens, Kurtis J. Weibe and Roc Upchurch bring us a hilariously fun and funny sword and sorcery tale of an all-female adventuring group. This is an interesting concept since the sword and sorcery genre is usually a hyper-masculine male power fantasy and the women in the stories are delegated to damsels in distress, wenches, or warriors gallivanting in chainkinis. 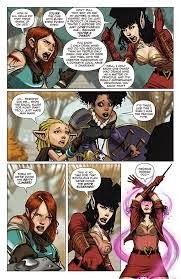 However in the Rat Queens the girls are just as capable and badass as their male counterparts. The team consists of Violet - a Dwarf Fighter, Dee - a human Cleric, Hannah - an Elven Mage, and Betty - a smidgen Thief. We follow the team as they deal with their emerging pasts and are forced to deal with the trouble they’ve been causing the town with their drunken brawls and trouble making. Unlike most people I’ve come across in my table top role playing experiences I enjoy a bit of contemporary life mixed into my fantasy world and Weibe does an amazing job of balancing it to create a very entertaining story and interesting characters, whether its Violet’s hipster attitude or Hannah’s rough and sarcastic temperament, the interactions between characters make this a really funny book. There was a part in the beginning of the second chapter where Violet and Hannah are arguing about how a 20ft Troll could sneak up on them, something that’s happened in a game session I’ve played before, that literally brought me to tears laughing. Upchurch’s art is impeccable and he does an amazing job illustrating the nonverbal cues of each of the characters. I’m impatiently waiting for Volume 2 to see a bit more of the characters past and to see how the events from the end of this volume progress. I highly recommend this series to people who are a fan of fun mixed into their sword and sorcery.